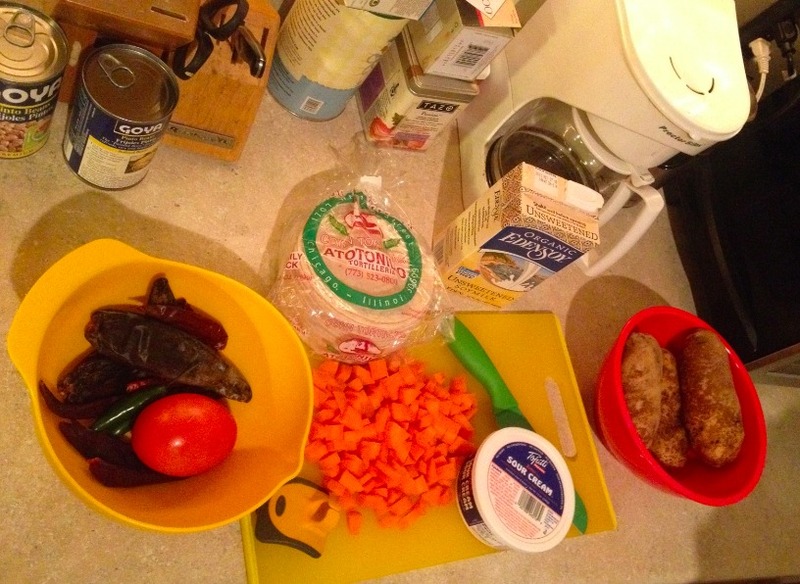 Honorary Vegetable-Shredder, Abigail has an authentic Enchiladas recipe to share. No casserole dishes and jars of pre-made sauce! 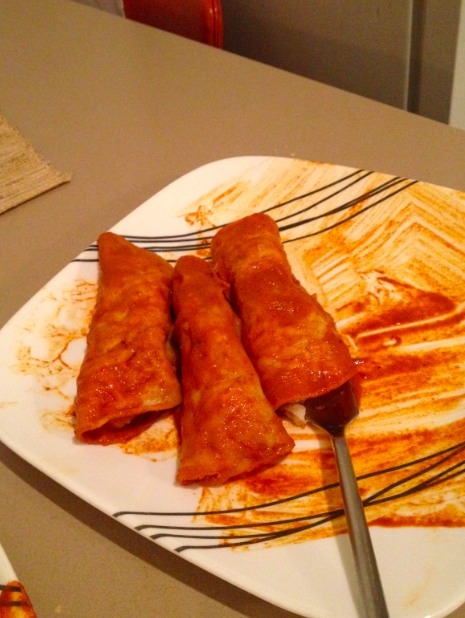 These are the real uh, yeah…enchiladas. 8 dried chiles: the original recipe calls for all guajillo but that come out kind of bitter for some people’s tastes–if you want to make it spicier, replace one guajillo with one to three arbol chiles (depending on your heat tolerance) and if you can’t find guajillo you can also use pulla/puya chiles. I tend to mix the two together to make a more balanced flavor. Ancho chiles are also commonly preferred in enchiladas and will give it a slightly smokey flavor. 1) Broil the tomatoes, serrano chiles, and garlic. All of these ingredients have different cooking times so make sure to check every few minutes if they are in the oven. If you decide to put them in a pan/comal just turn regularly so that the skin doesn’t stick to the pan. After all sides are blackened and wilted, set all the ingredients aside. 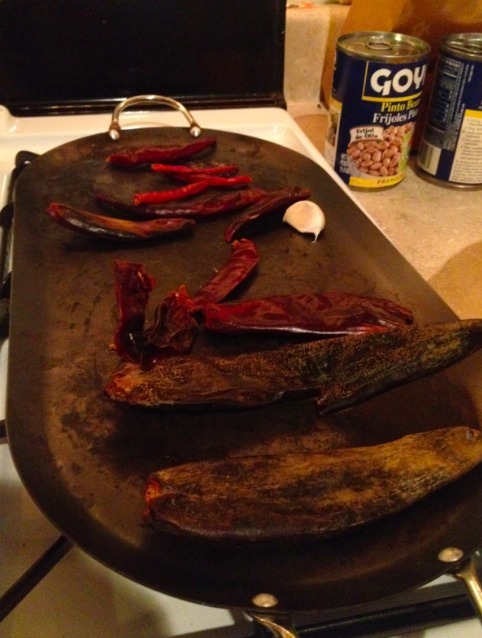 2) Toast the chiles in the pan or comal. Toast only until they are fragrant. 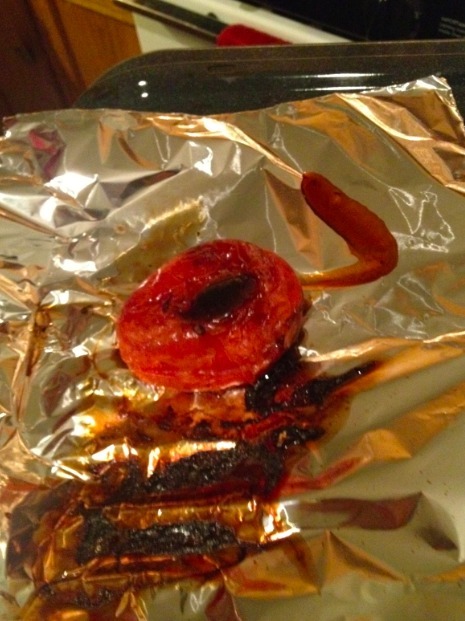 You don’t want them to be completely burnt and crispy, but they should be slightly blackened. Meanwhile, heat your milk to near boiling. When the chiles are finished, submerge in the milk. After 10 minutes feel the chiles (especially the guajillos) to make sure they are soft and not completely tough. 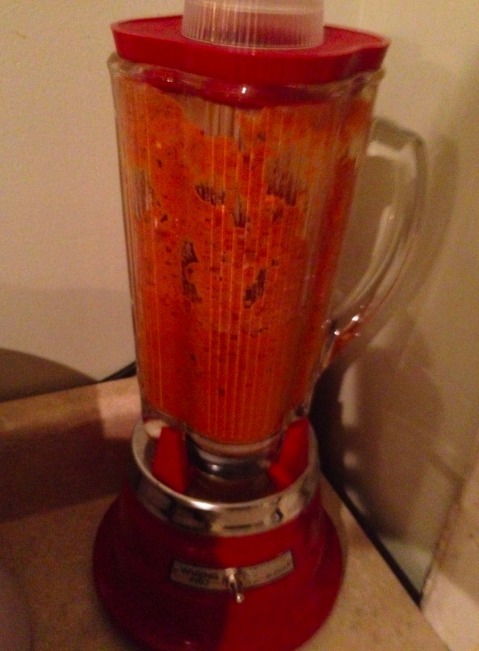 3) Put all the ingredients (including the milk) into a blender. Add salt to taste. Blend on liquefy until the color is even. Meanwhile, using a sauce pan, heat up a few tablespoons of oil for frying. 4) Pour the contents of the blender into a pot using the strainer. Use a spatula or wooden spoon to push all of the liquid into the pot. 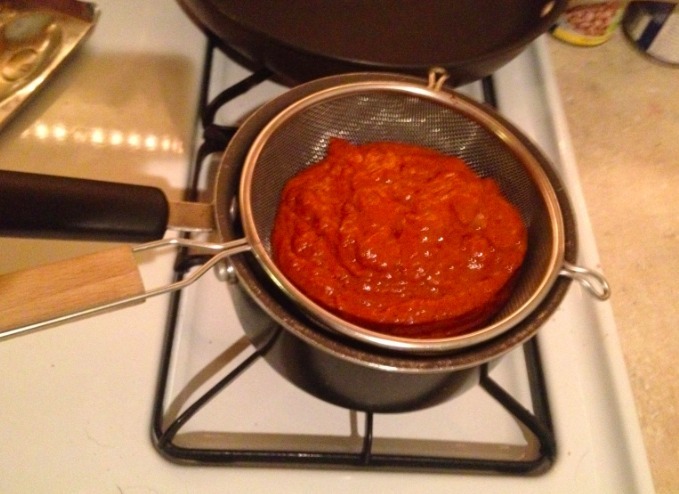 5)Heat the sauce on medium. 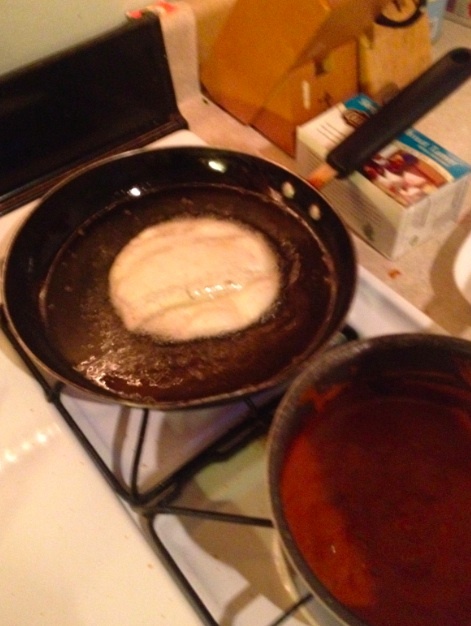 6)Test the oil by ripping up a piece of tortilla and throwing it in. It should puff up in a matter of a few seconds (10 maybe?). When the oil is ready, take your first tortilla and drop it in, letting it puff up on one side and then turning it to puff on the other side. This should not take too long. You don’t want to end up with a hard tostada but you do want it tough enough that it won’t rip when you dip it in the sauce. When it is finished, pick it up with the tongs and let the oil drip off for a few seconds. 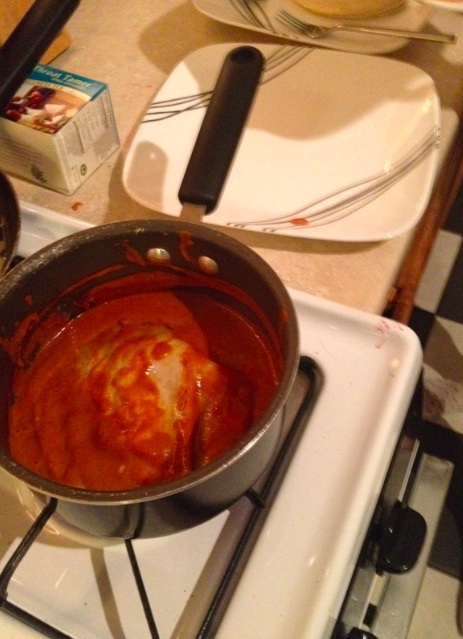 Then, dip it into the pot with the sauce getting one side covered quickly, and then turning it to cover the other side. Then transfer it to a plate open face. Now it is ready for fillings. 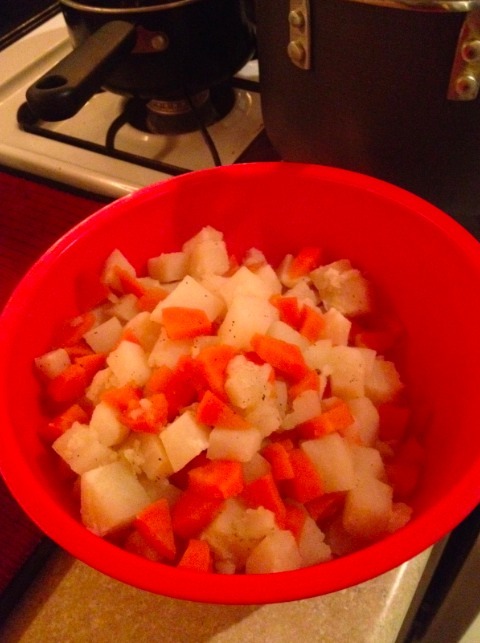 1) Peel and cut the potatoes and carrots into bit-sized pieces. Meanwhile, boil the vegetable broth. When the broth is boiling, add the potatoes, carrots, oregano, and salt and pepper to taste. 2) Boil until the potatoes and carrots are tender but not mushy. This is really up to your personal preference. After they are ready to your liking, drain the water. I like to keep them in the pot with the lid on after they are drained so that they stay warm while you finish up the sauce and dipping the tortillas. 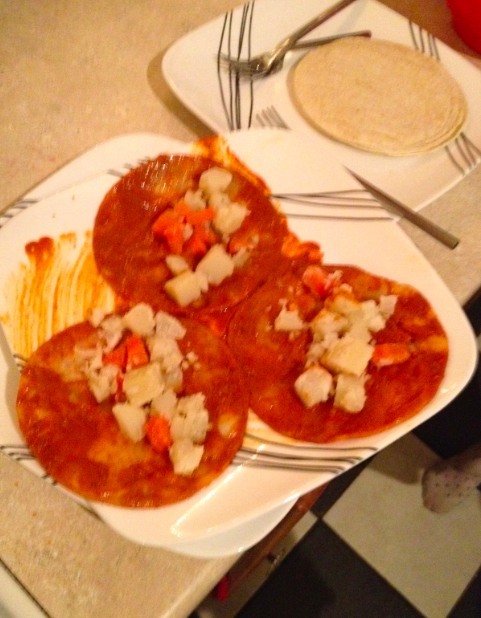 3) After you have laid the tortillas face up on the plate with all of the sauce, fill them with a just a couple spoons full of the potatoes and carrots. After the tortillas are rolled, garnish with shredded cabbage, onions, and vegan sour cream. Enjoy! 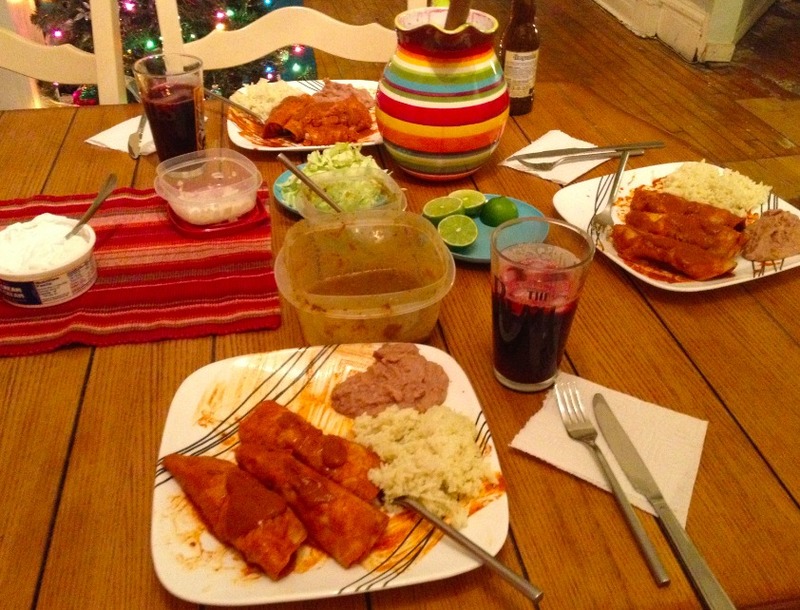 4 Responses to Enchiladas Tonight! looking forward to trying this recipe out.